They call it TNT Orange. I guess it’s a little different from the Habanero Orange on the Tiguan I drove weeks prior. TNT certainly describes the reaction when you step on the accelerator of the 2018 Volkswagen Golf R 5-Door. That orange will catch plenty of eyes. Not that Volkswagen want to draw attention to its products by, say, loaning reviewers cars in unusual colours. No. Of course not. Aside from the colour, the Golf’s shape remains about as unchanged as that of its iconic Beetle stablemate, and for the same reason. It’s recognizable, practical, and continues to communicate exactly what it’s for through its appearance alone. VW did tart up this Golf beyond the colour (an extra cost on this car) and a bunch of “R” badges. 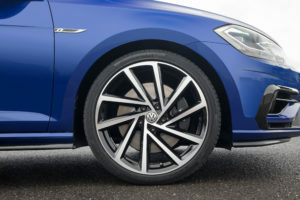 The alloy wheel package sporting low-profile tires have “tuner” written all over them. So do the black, “R”-branded brake calipers. The key fob features VW’s standard “switch-blade” key. It isn’t necessary. This Golf ships with keyless access and a start-stop engine button. If you haven’t yet figured out this Golf is a different beast, the interior offers a few more subtle clues. When you open the door, you see illuminated door sill plates. Footwell lights shine on brushed stainless steel pedals. An almost entirely Titan Black – Vienna Leather interior gets a few highlights from silver door strips and their ambient lighting, plus carbon decorative inserts in the dash and door panels as well as a piano black decorative insert in the centre console. Power-adjustable heated front seats were firm and comfortable. The side bolsters don’t grip your ribs the way they do in other sports cars, but you’ll notice them if you corner with extra verve. Headroom was plentiful, thanks in part to the omission of a moonroof. I almost had enough headroom for myself in the back seat too. That’s the benefit of not making the Golf’s roof slope down too rakishly towards the rear of the car. The chunky leather-wrapped flat-bottomed steering wheel proved comfortable, and not just for my hands. That flat bottom can add an inch of “kneeroom” that comes in handy when you shift gears. There was no hockey bag test this week. Instead, I slid my too-big-to-be-a-carry-on wheeled duffel bag straight into the hatch, then lowered my computer backpack beside it. A hockey bag ought to fit, but just. If yours doesn’t, check out the variable cargo load floor. 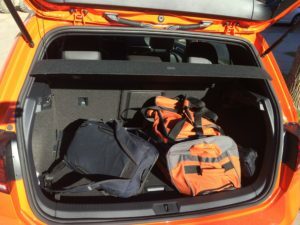 In an accidental touch of stylishness, my duffel bag matches the colour of the car. The 8” VW touchscreen in the middle of the dash hits all the right notes. Controls start as minimized icons in a narrow smartphone-like dock along the bottom of the screen. You trigger a proximity sensor each time you raise your hand to the screen. The dock responds by quickly becoming taller and adding labels for each icon. VW’s App Connect system enables Apple CarPlay, Android Auto and MirrorLink. SiriusXM® satellite radio is included. The optical disc player and SD card slots reside in the glovebox, a sign that interest in these gadgets among VW drivers may be waning. The Fender® Premium Audio System consists of eight speakers plus subwoofer. It’s enough to do serious damage to your hearing – until you put the Golf in reverse. The volume abruptly lowers to, say, a 1 out of 10, enabling greater concentration as you back into a parking spot or parallel park. If you take your Golf to the track, check out the Performance Monitor sport gauges. Touch the “Car” button to the right of the touchscreen and race-appropriate information takes over the screen. and other info you might want to note as you reel off laps. The instrument cluster is now one fully digital display called the Volkswagen Digital Cockpit. That large screen gives you greater control over what you see there. Make your choices using controls mounted under your right thumb on the steering wheel. Taken together, both the touchscreen and the digital cockpit can help drivers make the most of track days. On the safety side, the rear-view camera starts doing its thing only after you hear its “lid” pop up. That lid is the VW logo on the rear hatch. (That logo does double duty as the latch that opens the hatchback. The overall rear look is cleaner because of this design.) Drive forward, and the camera is once again protected. This simple idea ought to keep the lens free of snow and sleet all winter. Mate a turbocharged 2.0L 292-hp motor to a 6-speed manual transmission with VW’s 4Motion all-wheel-drive system and you’ll have drivers pushing the tachometer to its higher reaches to feel the Golf R push them back into their seats. Yes, the Golf R’s power makes it fun on highway on-ramps. The civility of the R took me by surprise. It’s quiet when moving at ordinary speeds. It may growl at speed, but it never feels as though control might slip through my grasp. Chalk that up to 4Motion. VW encourages you to embrace your multiple (driving) personalities by offering different driving profiles: Eco, Comfort, Normal, Sport and Race. If none of these are to your liking, you can choose your own set of custom driving dynamics. For a small, wheels-at-the-corners car, the R was disappointing in tight spaces. What I thought would be u-turns on narrow roads always turned into three-point turns. Feedback from the progressive steering system was phenomenal everywhere else. I just wanted to be able to crank the wheel a little more in certain circumstances. There’s no reason to omit adaptive cruise control when a car has a manual transmission. I used it on certain long drives. When traffic slowed, I was able to downshift while keeping ACC on, returning up through the gears and my set speed as traffic cleared. I just wish I could have continued using it when surrounding traffic morphed from comfortable cruising to stop-and-go. The manual recommends you not use ACC in first gear, presumably to avoid stalling the engine. The R’s power makes itself most apparent when, using adaptive cruise control, a slow-moving vehicle gets out of your lane, revealing a stoppage further on. The R sprints so hard to the nearly stopped vehicle ahead that each time this happened, I hit the brakes, alarmed at the acceleration in such inappropriate circumstances. I’d like to believe the R would have slowed in time, but I took no chances. The Golf displays the behaviour of each one of these technologies on the instrument cluster screen when they’re active. VW has designed the behaviour of these screens to communicate just what’s needed when it’s needed in ways that the driver ought to understand quickly. To the technical writer who wrote these words, VW managed a user experience triumph here. The base 2018 Golf R MSRP is $42,065.00. 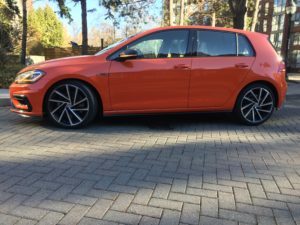 With alloy wheels, a driver assistance package and that TNT Orange covering the car, plus freight, PDI and excise tax on the A/C, this Golf comes to $48,605. The CD and SD card slot has been in the glove compartment for VW models for at least three to four years now. Regarding the SD card, I don’t think it has anything to do with waning interest as much as it is just more practical to store something out of the way that you will rarely need to remove. I have loaded my entire music library on my SD card and have left it in my GTI for months at a time without needing to remove it. A CD player is convenient to have, although I cannot recall the last time I needed to put a CD into ANYTHING. Maybe back in 2013 for a demo CD.